She's Fantastic: DC Collectibles HAWKGIRL (EARTH 2)! DC Collectibles HAWKGIRL (EARTH 2)! I think the costume redesigns in DC's New 52 has been hit-or-miss. In most cases I prefer the classic look over the new modernized designs. Hawkgirl is definitely a huge exception to that judgement, though. Don't get me wrong, her signature yellow, red, and green is perfect. I just also happen to love this blue redesign. 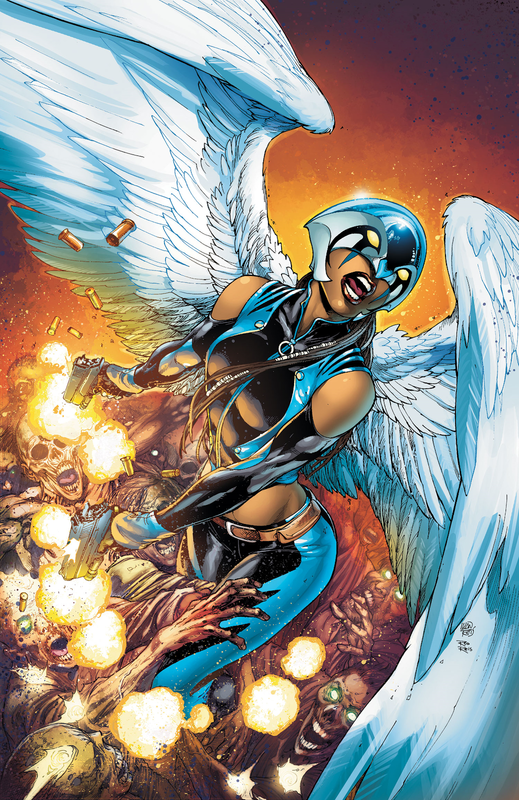 In the New 52, Hawkgirl of Earth2 is Kendra Munoz-Saunders, a famous treasure hunter who was bestowed with wings from the Egyptian God Horus while on a mission. She dons a unique blue costume that looks great with her skin tone. In the New 52, Kendra is a dark-skinned Hispanic girl. That ethnicity change is part of what makes Hawkgirl so intriguing. Despite having the same name and wings, you just have a feeling that this is an entirely new character that you have to (and want to) get to know. DC Collectibles is on a major roll this year. Aside from a couple cases of weird face paint, they've hit every lady out of the park. 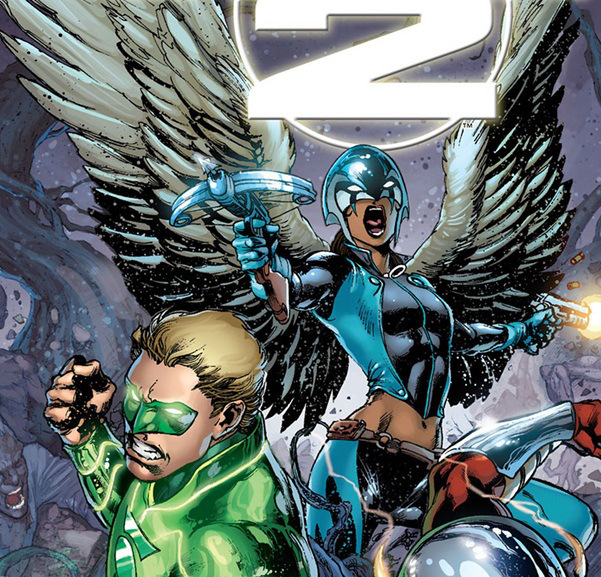 Let's check out Earth 2 Hawkgirl below! The sculpt by Sam Greenwell is amazing. I was afraid he was no longer working with DCC since he's been off the radar so long. He has a great skill for sculpting wonderfully feminine body types with all the right curves and realistic proportions. Hawkgirl comes packed with two detached wings as well as a pistol and a knife. The knife fits snuggly into a boot holster and the gun fits in another holster on her hip. I'm showing this position of the wings because they look really different when you fold the wings forward. 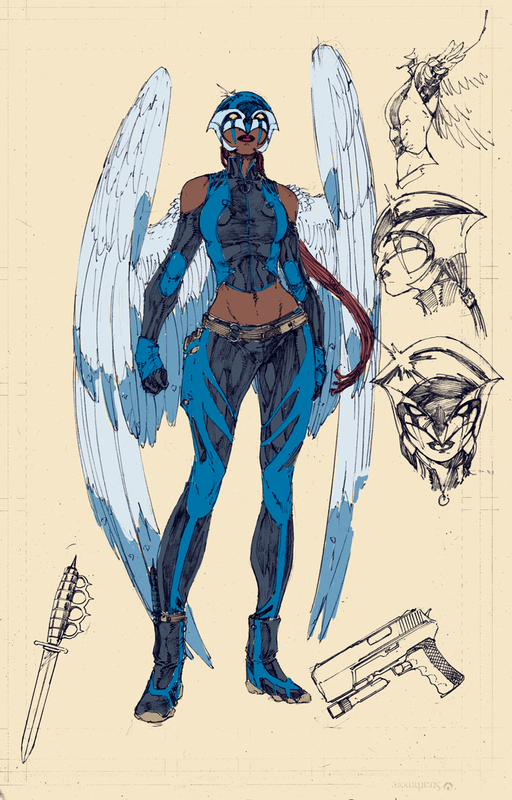 Here are some images of Earth 2 Hawkgirl from the comics. Here she is with the DCC New 52 Starfire and Customized Supergirl. And here she is with the DCUC Series 08 Hawkgirl from 2009 and DC Direct's JSA Series 1 Hawkgirl from 2007. E2 Hawkgirl may be my favorite DCC figure yet. I'm a little disappointed that they decided to forego the standard ankle articulation since she is a flying character, but other than that, she's close to perfect. I'm getting very spoiled with DCC releasing one great female figure after another. I hope the lack of solicitations the last few months doesn't mean that DCC is moving away from comic accurate New 52 figures. I'd be in Heaven if they continued working on the Justice League Dark and gave us Madame Xanadu, Black Orchid, and Amethyst, not to mention Deadman and Frankenstein. You're right the missing ankle articualtion really is a bummer. At the same time, I love how they approach articulation on a case-by-case basis. When I was tryingt o pose the DCUC Hawkgirl for the group picture, it was painfully obvious that her articulation wasn't catered to her particular figure. The arm isn't articulated to hold the spear properly and her head is stuck in place. I used to love that figure, but in comparison to newer DCC and Marvel bucks it's pretty lame. I can never have enough Hawk Women. I just love wings (love Hawkman too). Now give me Dawnstar and I'll be happy. Did you get a chance to speak with anyone at the DCC booth? Photos of their NYCC display have hit the net, and it's like New 52 never existed. They're not even displaying upcoming releases like Constantine and Zatanna. Actually no. I honestly wasn't aware the DCC even had a showroom until right now. I was just looking at the map and it was located on the floor with the coat check (ie.. no where near the other exhibitors). They suaully display DCC stuff and sell their exclusives at the Diamond Select or Graphitti Designs booth. I checked both of those but they weren't showing any new figures. I talked to those people and they had no news.I honestly wouldn't hate it if those Justice League Dark figures were postponed and reworked a little. I love the idea of of getting them, but the pictures looked a little funky. I read over at the Fwoosh that Constantine and Zatanna have been moved up to 10/22, so I doubt we're going to see much of a difference outside of the usual prototype to production paint changes that tend to lean in the funky direction. Now that I've read the book, I wish they had done Zee in one of her other outfits. I thought it was cool that she didn't wear a costume. As far as I can tell, she only wore the "superhero" one in a brief glimpse of a possible future. Oh, well. Even if this is it for New 52, we've had a nice run, and quality female figures seem more prevalent than ever. I just got my first Play Arts Kai figure the other day (Lara Croft), and I'm intrigued by the Magc the Gathering figures after reading you reviews. I saw a couple of them at Target yesterday, and they look pretty nice.